To tell you too much about it is to spoil it, which I’ve decided not to do for the purposes of this review. However, this was a very well-written, eloquent story. I enjoyed reading Han’s words even if I didn’t really completely get the plot just because they invoked that kind of beauty. The story centers on a typical Korean housewife, Yeong-hye, who, after having a series of violent dreams, decides that she is not going to eat meat anymore. Her husband, Mr. Cheong, is shocked at this revelation and does not know what he is going to do with her. From this point, there is a brewing conflict in their home which ultimately reaches into Yeong-hye’s immediate family and she goes into a downward spiral of madness and starvation (and a few more things I won’t reveal here) as a result. This book is interesting in that it is split into three novella-length parts, and Yeong-hye is not the primary narrator of any of them. The first part is told by her husband, Mr. Cheong, the second by her brother in law, J, and the third by her sister (and J’s wife) In-hye. Only during the first section does Yeong-hye occasionally interject, but only to tell of the disturbing content of her dreams that lead her to give up meat. Each narrator has their own agenda, and the reader only knows of Yeong-hye though their lens. This book is extremely short (less than 200 pages), but there was a LOT here. This is a book that ultimately I will probably end up reading again to fully understand, just because the plot was THAT heavy in symbolism and meaning. In here there’s brutal violence juxtaposed with beauty, complacency alongside action, and an reprehensible act involving a dog that truly gave me nightmares. I think this book grasps at a much larger message: how trauma in one person’s life ultimately creates ripples in a metaphorical pond that affects other people. 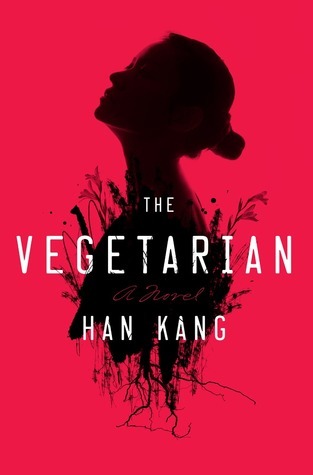 I must say though that now Han Kang is a writer that is on my radar. She has another book she’s written that is not available in the States that I am desperately trying to get a hold of now, and I eagerly anticipate more of her work to be translated into English.